We explored a tubal cytologic method by sampling the fallopian tube directly post-surgical excision as a tool of ovarian cancer early detection. Here, we present a protocol to collect fallopian tube cells from freshly received surgical specimens. Chen, H., Klein, R., Arnold, S., Wang, Y., Chambers, S., Zheng, W. Tubal Cytology of the Fallopian Tube as a Promising Tool for Ovarian Cancer Early Detection. J. Vis. Exp. (125), e55887, doi:10.3791/55887 (2017). Currently, it is widely accepted that the vast majority of ovarian high-grade serous carcinoma (HGSC) originate from the fallopian tube. However, due to the lack of markers or tools for the ovarian cancer identification, the early detection of HGSC remains challenging. Direct sampling of the fallopian tube can enhance sensitivity for detection of neoplastic cells when the tumor is not grossly visible. We developed a procedure to collect fallopian tube cells directly from freshly received surgical specimens, which has shown excellent correlation with histological findings. This approach lays a foundation for the future utility of minimally invasive laparoscopic screening in high-risk patient populations. Ovarian high-grade serous carcinoma (HGSC) is the most common and lethal type of ovarian cancer, and remains a major threat to the public health. In the past decade, researchers have suggested that the vast majority of HGSC cases arise from the fallopian tube instead of the ovary itself 1,2,3,4,5,6. Serous tubal intraepithelial carcinoma (STIC) is widely accepted as the precursor of HGSC 1,7,8,9,10,11. So far, early detection of ovarian cancer remains difficult. The current screening protocol with combined cancer antigen 125 (CA-125) and transvaginal ultrasound has shown little effect on patient mortality12,13. Endometrial sampling for ovarian cancer detection has shown an extremely low sensitivity14. Two pioneer studies15,16 explored the usage of laparoscopic direct sampling of benign fallopian tubes and characterized the cytological features of benign tubal epithelium. We believe that direct sampling from the fallopian tube can also be a practical and straightforward way to detecting STIC or HGSC at an early stage when the tumor is not visualized by imaging. Although the ultimate goal is the utility of minimally invasive laparoscopic screening in patients with high-risk factors, the immediate aims of current study are: 1) To establish the baseline cytological features of benign tubal epithelia; and 2) To test the sensitivity and specificity of tubal cytology in detecting ovarian cancers and cancer precursors. We therefore developed the following baseline tubal cytology method to test the effectiveness of this protocol in detection of HGSC and its precursor STIC17. In this study, we took advantage of the large volume of regularly received surgical specimens, and performed direct sampling of the surgically excised fallopian tube in addition to the routine grossing procedures. Our recent study17 showed that the cytological diagnosis of malignant or suspicion for malignancy is highly correlated with the histological diagnosis of HGSC (100%). In addition, the tubal cytological evaluation identified intratubal neoplasia in the only two histologically confirmed STIC cases involved in this study. We believe that tubal cytology has great potential in early detection and will provide valuable information for patient management. An Institutional Review Board approval was received from University of Arizona for conducting this study. Informed patient consent forms were obtained. NOTE: An Institutional Review Board approval was obtained from University of Arizona. A total of 38 patients were recruited. The patients' ages ranged from 32 to 86 years old with a mean of 55 years, of whom 26 patients were post-menopausal and 12 patients were pre-menopausal. Obtain informed consent from each patient. NOTE: The patients included in the current study were all scheduled for total hysterectomy and bilateral salpingo-oophorectomy for either prophylactic risk reduction or malignancy. The details of surgery were unknown for pathologist who performed the cytology study. Immediately after surgical excision, examine the fresh tissue specimen including uterus, bilateral ovaries, and bilateral fallopian tubes carefully to identify the bilateral fallopian tube. Collect and place fallopian tube cells into the preservative solution (see Table of Materials) vial within 30 min of clamping the blood supply; the recommended preservative is a methanol-based, buffered preservative solution. NOTE: Use a gentle touch brush for the tubal cell collection (upcoming steps). With the exception of rare cases in which the fallopian tube is submitted detached from the uterus, inserting a brush head to collect cells from the tubal fimbria occurs typically when the fallopian tube is attached to the uterus. With the help of a small forceps, insert the brush (see Table of Materials) into the lumen of the fallopian tube through the fimbriae end. Slowly rotate clockwise and move the brush forward through the infundibular portion of the fallopian tube, then the ampulla until it reaches the isthmus. Slowly rotate and reverse the brush counter-clockwise to pull out the brush. Ensure that the maximal speed of the brush within the lumen is slower than 1 cm/s. Rinse the brush in the preservative solution (in a vial) by rotating and swirling the brush 10 times in the solution. Record the patient's information and the laterality of the specimen. Store the vial in a 4 °C refrigerator (for up to) 6 months. Load the sample vial into the automated processor for slide preparation. NOTE: We use the automated processor for slide preparation. The following steps are performed automatically after the sample vial is placed into the processor: (i) The cells and debris are separated and dispersed through the rotation of the test filter within the sample vial. (ii) Tubal cells are collected from the exterior surface of the filter by a gentle vacuum. (iii) The filter is inverted and pressed against the slide to let the cells to adhere to the circular area within the slide. (iv) The slide is further fixed in a cell fixative bath and ready for staining and cytology analysis. Unfortunately, there is no alternative manual method, which can yield results with a similar quality. Stain the slides made from step 3.1 by running the automatized non-gyn stain procedure, as illustrated in Table 1. NOTE: The staining method represents a modification of the Papanicolaou staining technique that we use routinely for non-gynecologic specimens. We use an automated tissue processor to stain some slides. We chose the Non-Gyn staining procedure over the Gyn staining procedure in this study. The Eosin used is EA-65, instead of the EA-50 used for gynecological specimens (Pap smear specimen). In addition, OG-6 in the Gyn staining procedure, which is mainly for squamous cell staining, is not included in the staining procedure since no squamous cells are expected to be seen in this study. EA65 (Eosin Azure) is a counter stain solution comprised of 3 dyes: Eosin Y, Fast green FCF, and Bismarck brown Y. The procedure is illustrated in Table 1. Perform a manual quick Pap stain procedure as follows. Dip the slide made in step 3.1 into 95% ethanol, 10 times, with each dip taking about 1 s.
Dip the slide into H2O, 10 times, with each dip taking about 1 s.
Emerge the slide in hematoxylin for 10 - 60 s.
Dip the slide into 95% ethanol, 10 times, with each dip taking about 1 s.
Emerge the slide in EA65 for 1 - 3 min. Dip the slide in xylene until the slide becomes clear. NOTE: This is a modified Papanicolaou staining procedure. This method is used as a more rapid stain method for cases with limited time or space like on-site fine needle aspiration and STAT specimens. This procedure provides comparable quality staining as the automatized Non-Gyn stain procedure. The procedure is illustrated in Table 2. NOTE: Three cytospin slides are made for each specimen. One slide is H&E stained for the morphological comparison with the cytology slide. Two unstained slides were made for the future IHC staining study. The detailed steps of this section are not the focus of this paper; therefore, we will not discuss them in extended details. Prepare a cytocentrifuge with a labeled slide, specimen funnel and filter for each sample to be examined. Concentrate the cells by centrifuging for 5 min at 200 x g.
Remove about half of the supernatant and then re-suspend the cells by gentle pipetting. Add 200 µL of each cell suspension to a specimen funnel. Spin at 250 x g for 5 min. Carefully remove the slide(s) from the cytocentrifuge and transfer them to 95% Ethanol for fixation. Air dry prior to staining and for long term storage. NOTE: Depending on the cell density on the final slides, step 5.2 and step 5.3 can be skipped or adjusted. In this study, we require at least 2 cell clusters present per high power view for adequate cellular density. Fix the entire specimen (including uterus, bilateral fallopian tubes, and ovaries) in 10% formalin prior to grossing to minimize exfoliation. Gently and carefully detach the fallopian tubes from the uterus at the isthmus using small forceps and a scissors. If adhesion is present, carefully dissect the fimbriated end from the ovary surface using small forceps and a scissors; these steps are crucial to minimize tumor cross contamination between ovary and fallopian tube due to their intimate proximity. Amputate the infundibulum and fimbriae segment (the distal 1.0 - 2.0 cm of fallopian tube) from the rest of the specimen. Section the infundibulum and fimbriae longitudinally at 2 mm intervals. Submit all sections in toto for histologic examination. Section the isthmus and ampulla at 2 - 3 mm intervals and submit entirely. Our previous study showed that sampling directly from the excised fallopian tube using a gentle touch brush could yield quantitatively and qualitatively adequate specimen for further cytological evaluation. In addition, the combination of automated slide preparation and modified Papanicolaou staining enable the pathologist to better visualize the cytological details to make an accurate diagnosis. An example of a manual quick pap stain of a specimen from a benign fallopian tube is illustrated in Figure 1. As shown in Figure 1, the brush maneuver results in adequate sampling of the specimen. Moreover, the manual quick Pap stain provides good resolution of nuclear details and cytoplasmic transparency, which are essential for the accurate evaluation of the tubal cells. The comparison between the manual quick Pap stain of a cytology slide and the H&E staining of a cytospin slide is shown in Figure 2. One of the advantages of the above-mentioned slide preparation compared with conventional smear is that it has a much cleaner background and better resolution of nuclear details and cytoplasmic transparency. 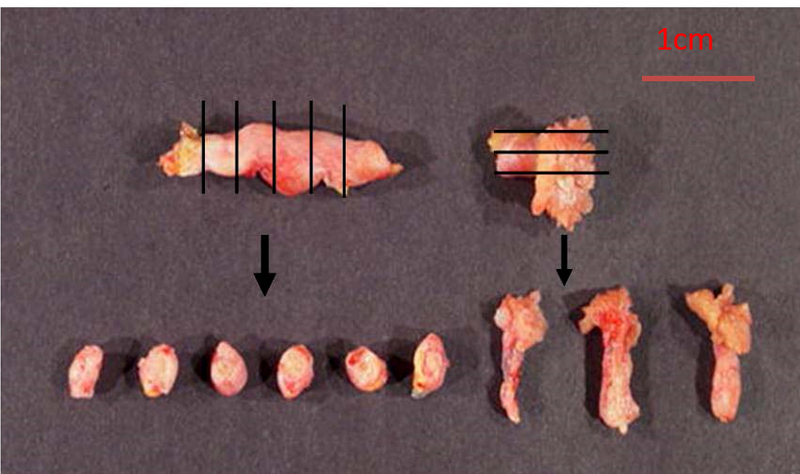 One example of SEE-FIM of the Fallopian Tube Protocol is demonstrated in Figure 3. As shown in Figure 1, the presence of two cell populations (ciliated cells and secretory cells) is a feature of benign tubal epithelium. The histology of representative sections of the fimbria and ampulla is shown in Figure 4. The brush maneuver shows mild disturbance of villi structure in about one third of specimen. In our previous study17, the tubal cytological diagnosis correlated with the histological diagnosis of HGSC very well (100%). The cytological appearance of malignancy shows three-dimensional clusters composed of cells with prominent nucleoli and anisonucleosis (Figure 5a). In contrast, the atypical reactive cytology presented as angulated sheets composed of atypical cells with small nucleoli and moderate anisonucleosis without three-dimensional clustering (Figure 5b). HGSC-like cell groups were noted within the context of angulated sheets of normal epithelial cells (Figure 6). Figure 1: Example of a Manual Quick Pap Stain of the Benign Tubal Epithelium. (A) Background cells. Background cells include small cell clusters consisting of large secretory cells and small ciliated cells, single large (presumably secretory cells) and small (presumably ciliated cells) cells, scattered large and small bare nuclei. (B) Small cell cluster consisting of small ciliated cells and large secretory cells (arrow). (C) Strip of ciliated epithelium (arrow). (D) Tubal epithelium with mesothelial-like sheets. Noted the clinging ciliated cells at the periphery (arrow). Please click here to view a larger version of this figure. Figure 2: Comparison Between Manual Quick Pap Stain of a Cytology Slide (A) and H&E staining of a cytospin slide (B). A benign angulated cell cluster is present in the center of both the Pap stain and H&E stain slides. Both methods provide good resolution for cytological evaluation of the specimen. However, the Pap stain of the cytology slide yielded a cleaner background. Please click here to view a larger version of this figure. Figure 3: Illustration of SEE-FIM of the Fallopian Tube. Please note the longitudinal sectioning of the infundibulum and fimbriae segment and the transverse sectioning of the isthmus and ampulla. Please click here to view a larger version of this figure. Figure 4: Histology of Benign Tubal Epithelium. (A) Fimbriae segment. The tubal epithelium consists of two distinct cell populations: small ciliated cells (arrows) and large non-ciliated secretory cells (circles). Slight villa disturbance is noted. (B) Ampulla section. Note the finger-like fimbria. (C) Mild disturbance of villi structure (arrow). Please click here to view a larger version of this figure. Figure 5: Comparison Between Atypical Cluster (a) and Three-dimensional Malignant Cluster (b). Malignant cytology shows three-dimensional clusters composed of cells with prominent nucleoli and anisonucleosis (b). Atypical cytology shows angulated sheets composed of atypical cells with small nucleoli and moderate anisonucleosis. Note: No three-dimensional clustering is present (a). This figure has been adopted from reference17. 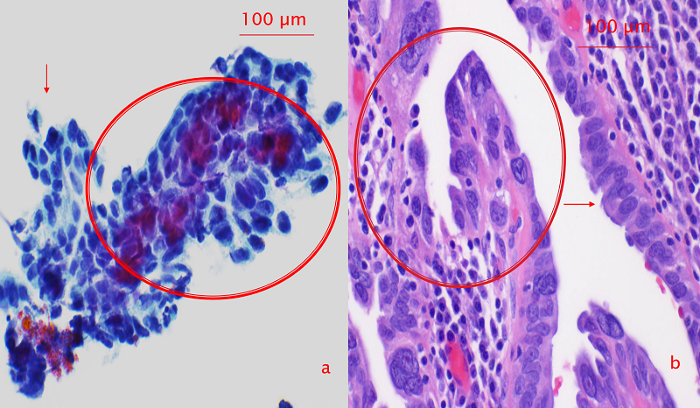 Figure 6: Correlation Between Cytological and Histologic Appearance of Intraepithelial Neoplasia. (a) Cytological intratubal neoplasia. Cytological intratubal neoplasia showing acquisition of three-dimensional contour and significant anisonucleosis and large cherry red nucleoli (circle) within the context of angulated sheets of normal epithelial cells (arrow). (b) Corresponding surgical pathology section with tubal intraepithelial carcinoma. Note the highly dysplastic cells (circle) adjacent to the relatively normal appearance epithelial cells (arrow). This figure has been adopted from reference17. Please click here to view a larger version of this figure. Table 1: Non-Gyn Stain Steps. Table 2: Manual Quick Pap Stain Steps. Prophylactic bilateral salpingectomy or salpingo-oophorectomy has been shown to decrease the risk of developing HGSC in high risk populations, such as women with BRCA gene mutations and strong familial cancer history. However, the sterility and surgical menopause caused by the surgery are serious consequences and make for a difficult decision, especially for women of childbearing age. The previous study has shown excellent correlation between tubal cytology and histology17. We believe that tubal cytology on laparoscopically collected fallopian tube cells has great potential to become a practical, minimally invasive tool for early cancer detection. The most critical steps for successful collection of fallopian tube cells are: 1) The time between the clamping of blood supply and collection of cells; and 2) Gentle and correct maneuver of the gentle touch brush. 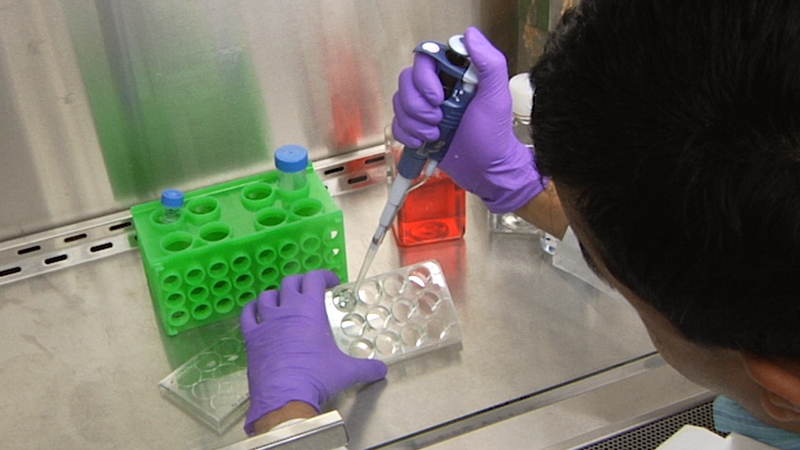 The time (within 30 minutes) between clamping and collection of cells is crucial for good preservation of the morphology and nuclear details of collected cells. Effective communication between pathologists and the surgeons ensure that the specimen is delivered to the collecting site within this period. The vast majority of cases included in the study were performed in the frozen section room. To successfully collect tubal cells, the person who performs the collection should try as best as possible to avoid letting the brush touch the ovarian serosal surface due to the staging implication if the case is malignant. Sometime, this may be difficult due to the proximity of the two organs involved and the complexity of the specimen anatomy. Separation of fallopian tubes from the entire specimen before the collection may be warranted. The gentle touch brush used in this study can collect a large number of cells that can then be easily transferred to slides or a preservative solution vial, and has a gentle-touch tip designed to minimize trauma to the canal. Moreover, the entire maneuver needs to be slow and gentle to avoid severely disturbing the villous structures of the tubal mucosa. For some cases, it may be difficult to get the brush pass the entire fallopian tube due to obstruction. Nevertheless, it is important to try as best as possible to collect cells from the fimbriae and infundibular portion, since it is believed that the majority of the HGSC originates from the distal end of the fallopian tube. However, the collection should not proceed if the integrity of specimen can be potentially compromised. Based on our experience, the specimen can be stored in preservative solution for several months without compromising the morphology of the collected cells. The Papanicolaou stain is a commonly used cytological staining technique in cytopathology. The main advantages of this staining procedure include: 1) Good definition of nuclear detail; and 2) Cytoplasmic transparency. 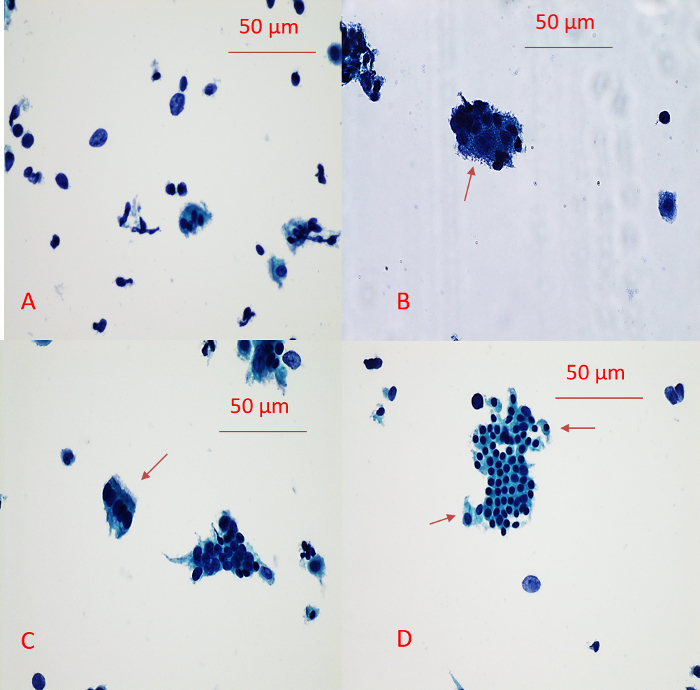 In this study, two modified Papanicolaou stain procedures are used for the cytology slides staining, including the automatized Non-Gyn staining procedure and the Quick Pap stain procedure. Both procedures give excellent and reliable slide staining, which shows good preservation of nuclear and cytoplasmic details, and clean background. Although cytospin slides generally have greater background when compared with cytology slides, their H&E stain demonstrated similar quality of cell staining. The H&E staining of these slides can be a suitable alternative method for tubal cytology analysis if an automatic processor is not available. The SEE-FIM protocol is used for grossing all the fallopian tubes included in this study, including both benign and malignant cases. The SEE-FIM protocol was initially developed for BRCA-positive prophylactic bilateral salpingo-oophorectomy specimens, which is a standard risk-reducing option for BRCA mutation carriers. This protocol allows the maximal exposure of the tubal plicae, from which the STIC is believed to originate. This is currently taken as the gold standard for detecting HGSC tubal extension and STIC. The correlation between tubal cytological finding with SEE-FIM histological finding is crucial for this study to validate the efficiency of the current protocol. One concern of tubal cell collection using a gentle touch brush is that the maneuver may disturb the integrity of the tubal epithelium and hinder the later accurate histological interpretation of surgical specimens, especially the staging of tumor, if malignancy is identified. However, based on our experience, about one third of cases show mild disturbance of the villi on histology analysis, which generally does not interfere with the final interpretation of the tubal histology. Our previous study has shown that tubal cytology is sensitive and specific in detecting HGSC and STIC. It will be of great interest to further test whether the combination of tubal cytology with biomarkers staining such as P53 and IMP3 may increase the sensitivity and specificity of detecting serous cancer of tubal origin. Future study will focus on developing a laparoscopic procedure for fallopian epithelium sampling in vivo. The authors would like to acknowledge the Department of Pathology, University of Arizona, for the financial support. The project is partially supported by the Mark and Jane Gibson endowment fund to WZ. Carlson, J. W., et al. Serous tubal intraepithelial carcinoma: its potential role in primary peritoneal serous carcinoma and serous cancer prevention. J Clin Oncol. 26, (25), 4160-4165 (2008). Kurman, R. J., Shih Ie, M. The origin and pathogenesis of epithelial ovarian cancer: a proposed unifying theory. Am J Surg Pathol. 34, (3), 433-443 (2010). Lee, Y., et al. A candidate precursor to serous carcinoma that originates in the distal fallopian tube. J Pathol. 211, (1), 26-35 (2007). Li, J., Fadare, O., Xiang, L., Kong, B., Zheng, W. Ovarian serous carcinoma: recent concepts on its origin and carcinogenesis. J Hematol Oncol. 5, 8 (2012). Przybycin, C. G., Kurman, R. J., Ronnett, B. M., Shih Ie, M., Vang, R. Are all pelvic (nonuterine) serous carcinomas of tubal origin? Am J Surg Pathol. 34, (10), 1407-1416 (2010). Zheng, W., Fadare, O. Fallopian tube as main source for ovarian and pelvic (non-endometrial) serous carcinomas. Int J Clin Exp Pathol. 5, (3), 182-186 (2012). Carcangiu, M. L., et al. Atypical epithelial proliferation in fallopian tubes in prophylactic salpingo-oophorectomy specimens from BRCA1 and BRCA2 germline mutation carriers. Int J Gynecol Pathol. 23, (1), 35-40 (2004). Leunen, K., et al. Prophylactic salpingo-oophorectomy in 51 women with familial breast-ovarian cancer: importance of fallopian tube dysplasia. Int J Gynecol Cancer. 16, (1), 183-188 (2006). Piek, J. M., et al. Dysplastic changes in prophylactically removed Fallopian tubes of women predisposed to developing ovarian cancer. J Pathol. 195, (4), 451-456 (2001). Crum, C. P., et al. The distal fallopian tube: a new model for pelvic serous carcinogenesis. Curr Opin Obstet Gynecol. 19, (1), 3-9 (2007). Jarboe, E. A., et al. Tubal and ovarian pathways to pelvic epithelial cancer: a pathological perspective. Histopathology. 53, (2), 127-138 (2008). Menon, U. Ovarian cancer screening has no effect on disease-specific mortality. Evid Based Med. 17, (2), 47-48 (2012). Buys, S. S., et al. Effect of screening on ovarian cancer mortality: the Prostate, Lung, Colorectal and Ovarian (PLCO) Cancer Screening Randomized Controlled Trial. JAMA. 305, (22), 2295-2303 (2011). Otsuka, I., Kameda, S., Hoshi, K. Early detection of ovarian and fallopian tube cancer by examination of cytological samples from the endometrial cavity. Br J Cancer. 109, (3), 603-609 (2013). Dhanani, M., Nassar, A., Dinh, T. Classification of Fallopian Tube Cytology Sampling to Develop a Model for Future Peritoneal and Ovarian Cancer Screening. J Am Soc Cytopathol. 3, (5), S35-S36 (2014). Rodriguez, E. F., Lum, D., Guido, R., Austin, R. M. Cytologic findings in experimental in vivo fallopian tube brush specimens. Acta Cytol. 57, (6), 611-618 (2013). Chen, H., Klein, R., Arnold, S., Chambers, S., Zheng, W. Cytologic studies of the fallopian tube in patients undergoing salpingo-oophorectomy. Cancer Cell Int. 16, 78 (2016).